Why is it so hard to pick the best Santa Barbara wine country hotels? We are often asked, "Where should I stay when I'm wine tasting in Santa Barbara?" The size of Santa Barbara wine country makes this very difficult to answer. The first step is to narrow your search based on the wineries you want to visit. Our answers will differ if you are focusing on wine tasting in Los Alamos and the Santa Maria Area versus focusing on the Funk Zone tasting rooms. Or maybe you want to spend most of your time in Los Olivos and Solvang? The next step is to decide on a budget. Are you planning to spend a lot of time at your hotel? Do you want spa services, a pool, and onsite dining or is your goal to find a nice comfortable bed to crash on after a full day in the vineyards? As you can see, picking the best Santa Barbara wine country hotels or motels depends on you and your goals. We want to give you a few of our favorites from a few different categories. Do you want a luxury hotel close to the Funk Zone? A mid-priced hotel in Santa Ynez or a fun and funky motel in Los Alamos? That's something you need to decide. The Ballard Inn is a great choice if you want t0 focus your wine tasting in the area around Los Olivos and Solvang. The inn is just minutes from the tasting rooms of Los Olivos. You can easily explore the excellent wineries of the Santa Ynez Valley and the southern end of the Foxen wine trail. The inn blends country charm and hospitality with high-end dining options. Rooms run between $300 and $400 per night. There are a number of packages you can purchase when booking a room. A package that features a cycling tour of the wineries is highly rated. We like the proximity to the wineries and the fact you can head back to the inn for a great dinner at the end of your wine tasting adventure. The rooms are comfortable and will add a bit of romance to your trip. We love visiting the wineries of the Santa Maria Valley. Some of our top Santa Barbara Wineries for visitors are located close to the town of Los Alamos right on the edge of this cool climate wine district. The Skyview Motel is a great mid-priced Santa Barbara County option for exploring the town of Los Alamos and the surrounding wine country. The Skyview is a re-imagined version of the classic 50's roadside motel. The rooms are immaculate and kitted out with lux amenities sourced from unique producers. They offer four room sizes from basic, or "cozy" as they describe it, to jr. suites with patios, firepits and outdoor showers! The vibe at the Skyview is definitely casual elegance western style. The desert landscaping, faux cactuses at the entry of the restaurant, and the firepits strategically placed in the common areas give you a sense of place. This Santa Barbara wine country hotel also features a beautiful pool/bar area. You can finish your grueling day on the wine trail with a cheese plate, glass of chilled wine and sunscreen next to the pool. Traveling with kiddos? They will love the pool almost as much as they will enjoy roasting marshmallows over one of the firepits. Because of the great location, reasonable room rates and top-notch ammenites, we consider the Skyview one of the best Santa Barbara hotels for wine travelers. You will remember a stay at the Alamo. After an extensive remodel, a once run-down motel was reborn as the funky center of this emerging wine destination. The Alamo decor is influenced by Georgia O'Keefe's beloved New Mexico home. The minimalist design, extensive use of sculptural animal skulls and plywood furniture gives this motel a one of a kind feel. The motel also puts you within walking distance of a number of top-notch wine tasting rooms. Many of the tasting rooms in the area operate from Fri - Sun, so plan accordingly. There is an outpost of the popular Muni Winemakers that fronts the motel. This is a popular spot for locals on the weekends. We love the king suite. With room to spread out and a kitchen, this is the perfect weekend base for enjoying the Santa Barbara wine country. Rooms range from $80 to $160.  Click to check current prices. Want to get an idea of what you can do in Los Alamos? Check out our guide. When you are on the grounds of the Bacara Resort, you would never the guess that the city of Santa Barbara is so close. The sprawling complex features beach access, an oceanfront pool, on-site dining and a 42,000 square foot spa. 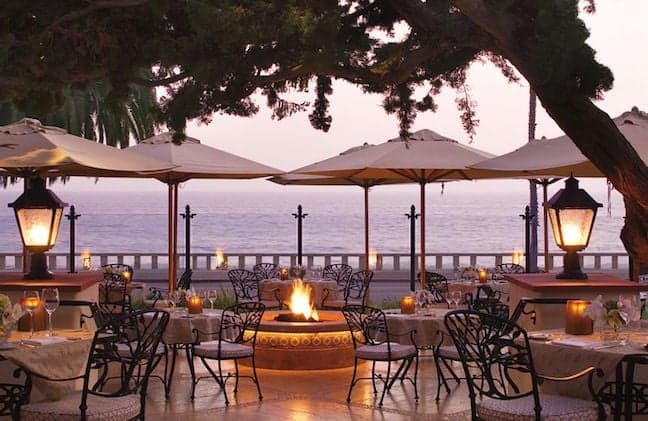 Staying at Bacara is pure luxury. The temptation to never leave the resort will be strong but don't give in. It's hard to do justice to the beauty of the resort. You really need to see if to truly appreciate it. We recommend you take a car service into the city to experience the Funk Zone, Santa Barbara Urban wine trail and the cluster of tasting rooms around the El Paseo building. The trip to Los Olivos or the Wine Ghetto in Lompoc is about 30 mins, give or take. Rates for Bacara start at $650 and go up from there. Take advantage of the Priority Wine Pass special to save! This little slice of heaven is located on the southern end of Santa Barbara. The hotel embodies Central Coast casual luxury. The lush grounds frame Mediterranean style bungalows and the central building that houses the restaurant and a wonderful bar/lounge. The rooms are typical of Four Season resorts with high-end bedding and amenities. We love that staying at the hotel gives you access to the Coral Casino Beach Club. This exclusive beach club is positioned on the edge of the Pacific Ocean. You can enjoy views up and down the coast while you dine at the club. You can also enjoy the Olympic sized swimming pool on warm Santa Barbara days. The hotel will arrange wine tours for you. The urban wineries are the easiest to visit, but many tours will take you up to Santa Ynez if you want to enjoy the vineyards! Like the Bacara, rates start around $650 per night and go up from there. 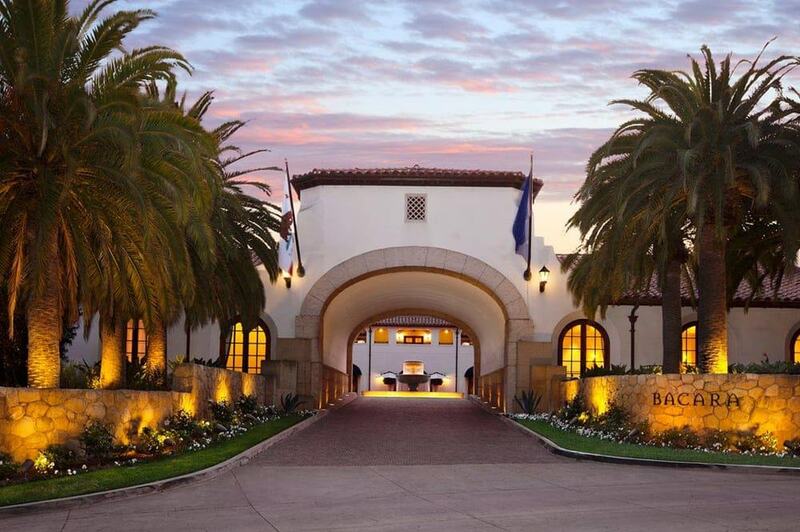 Click here for a special deal on this Santa Barbara hotel. This is a charming hotel in the city of Santa Barbara. Even though you are walking distance to the best restaurants and some great wine tasting rooms, the hotel feels miles from the hustle and bustle. The rooms are charming in the main building if a little small by modern standards. The bathrooms are upgraded with nice showers. The real charm of this hotel starts in the courtyard behind the main building. This is where you find the cottages, a nice area of green and a wrap around porch with seating. This is a little oasis. You can recharge here after a long day at the Santa Barbara tasting rooms or start your day with a cup of coffee. The hotel offers a complimentary continental breakfast and wine tasting in the afternoon, but the part we really like is the proximity to the wineries and the charming courtyard. Free parking is another bonus! We've found rooms here for under $200. You pay closer to $400 to stay in one of the cottages. Check discount sites for specials before you book. So which wineries should you visit now that you have a Santa Barbara Wine Country hotel? Here are some resources to help you plan your wine tasting adventure. MAKE SURE YOU ENTER THE CODE CWA15 TO RECEIVE OUR SPECIAL DISCOUNT ON THE PRIORITY WINE PASS. Click here to learn more about the benefits of the Wine Pass! The best way to save on Napa wineries, hotels and transportation. Get free assistance with planning your visit from Napa insiders!